Pope Francis meets with energy executives in Rome. Photo courtesy of Vatican Media. 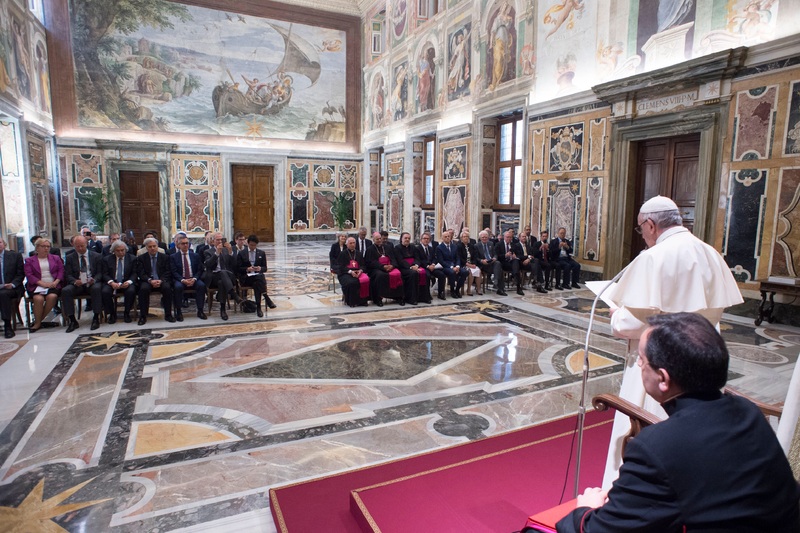 “The energy question has become one of the principle challenges facing the international community,” he told participants when he met them at the end of the June 8-9 conference held behind closed doors at the Casina Pio IV of the Pontifical Academy of Sciences. “The way we meet this challenge will determine our overall quality of life and the real possibility either of resolving conflicts in different areas of our world or on account of grave environmental imbalances and lack of access to energy, providing them with new fuel to destroy social stability and human lives,” he said. His audience included the CEOs of BP ( Bob Dudley), Exxon Mobil (Darren Woods), Eni (Claudio Descalzi), Equinor, Norways’ state-owned energy company ( Eldar Saetre), the chief executive of investment giant BlackRock (Larry Fink) and Ernest Moniz, the U.S. Energy Secretary under President Obama, as well as two facilitators—Carolyn Woo (formerly of CRS) and Professor Leo Burke of Notre Dame university. The conference was organized by the Vatican’s dicastery for Service of Integral Human Development and the University of Notre Dame Mendoza College of Business. He did not mention, however, another disturbing fact that everyone was aware of: President Donald Trump’s decision to withdraw the United States from the Paris Agreement. The pope, the Holy See as well as governments around the world consider that decision as a major blow to combating climate change. He emphasized that “renewal calls for a new form of leadership, and such leaders must have a clear and profound realization that the earth is a single system and that humanity, likewise, is a single whole” and then went onto suggest that the oil, gas and investment executives could provide some of that greatly needed leadership. A lot of disconnects. The world has more food than it ever did. There is less poor than there ever was despite 7 billion people. The US under Trump is the world leader in reducing carbon emissions. Germany and much of Europe uses coal. The Paris accords was not about reducing carbon emissions. What ravages of poor countries by climate changes? If one wants to see ravages from climate change study Northern Europe in the early 1300's. Why can't the Vatican deal in facts? Our acts of commission and omission that inflict poverty on fellow human beings and on our dear Planet cannot be our ways of proceeding. Think, what state is a human being in when first born? Naked, almost totally powerless and devoid of all possessions. Thus were all our ancestors and ourselves right up to the present day. By the sweat of their brows, the strain of their muscles, the sharpness of their wits and their exchange of knowledge and understanding, humans painfully accumulated the capability of providing themselves and their unproductive extended kin with food for tomorrow and then for a while and then for a season and then as a community for a lifetime. On the way they increased their provision using animal muscle power as well as their own and fire power as well as their human warmth and began to work at specialisation, division of labour and exchange. There was NO wealth before it was generated as above. No-one had any right to the fruits of the labour of anyone else, just their own. Sharing was a gift, from the men and the women in their different ways, to those they loved and valued. Wealth earned and generated is NOT stolen from anybody - it is generated by the labour and ingenuity of some. "Property is theft" comes from the lying lips of Satan through the Marxist creed. The planet is in the same capable hands as it has been in since it was accumulated from stardust billions of years ago as the Holy God tells Job and his comforters in a very, very old book. As has been happening since the moon was put in place, the climate of earth rather than being stable has been periodically changing in a complex cyclical pattern under the control of the sun and the various complex changes in the orbit of the earth and other planets and cosmic rays. We are just emerging from an ice age which is giving mild and slow warming and that in its turn is increasing the level of C02 in the atmosphere and that is bringing about a greening of the planet with increased tree and plant growth and crop yields. Cold kills the poor and vulnerable and exposed much more than warmth and the crops feed their hunger better every year. Our duty is to "clean our rooms": sanitation, clean water, clear air, less plastic, less industrial and chemical pollutants; a big enough job within human capability. We're not coming out of an ice age. That was 12,000 years ago. We should be going back into one but quite the opposite is happening, rapidly and not on the order of the Milankowic cycles which are on the scale of tens of thousands of years. What you posted is nonsense to climate scientists. If one wants to examine climate change, the first part of the 14th century was dramatic. From four hundred years of the Medieval Warming period (temperatures higher than today) to the Baltic freezing over three time in the early 1300's. It was the beginning of major climate change. A new cold age in which harvests for several years were destroyed and millions starved to death. Thirty years later the Black Death hit. It was not a good time. It was the time of Hansel and Gretel (Grimm's tale had it origin in stories from the Great Famine of 1315-21), William Tell, the Avignon papacy and anti Popes. Putting aside that Europe is only a small region of the globe, I know of no reputable scientific reconstructions of temperature that support your statement that medieval temperatures were higher than today's. Graphs seem to indicate around +0.8°C. That was the time when there was a cathedral and two monasteries in Greenland. Which proves what without reconstruction from proxy data?Anecdotal, not analytic. Regional, not global. It got colder in Europe. It wasn't warmer before that than now in Europe, not by any scientific study. You should read more about the medieval warming. We are moving and I was going through a box of course work from one of the science methodology courses I took in a Ph.D program. In it I found a cartoon. It was a scientist sitting at his desk with an in box that said theories and was piled high to the ceiling. There was an out box that said proofs and it was empty. Pretty much science as I understand it. You might get a valid study where 97% of scientists agree with the proposition in this illustration. The climatology of global warming is based on measurement and well established scientific theory, PROVEN theory. Of course, some people prefer cutesy cartoons to science as a way of dismissing science when they find the conclusions unpalatable. What is the sensitivity of temperature to CO2 levels? Answer they do not know. Which makes all climate models suspect? Oh, but it is settled and based on well established theory. From your comments, you have no idea what I believe. The cartoon represents correct scientific thinking. But there should also be a trash can that says rejected theories. That would be bigger than the whole room. The sensitivity is not known exactly to ten decimal places but is determined with enough accuracy. Even without computers, Svante Arrhenius calculated it to be 2°C per doubling of CO2 from 275ppm to 550ppm. We are around 400ppm. Global warming is at 0.8°C. The climatic effects are starting to become apparent. Your post and your cartoon don't represent science as much as a lawyer trick to generate a free floating doubt. Oh, how can we know anything. More postmodern than scientific. We're not talking proving parallel universe theory. We're talking work carefully applying well established physics. That the weather was warmer than today for a long period of time in order to build a cathedral and two monasteries. Better than any tree rings I know. Correlation between tree rings and temperature is demonstrable. There are a lot of trees to sample. What is the correlation between monastery building and temperature? Has there been a graph done with a linear regression. Since monasteries existed from the Holy Land up to Germany, I'd say correlation with temperature is rather weak. The other problem with your example us that it's regional and not global. A slowdown in the Gulf Stream could have been the culprit. How does that disprove that increased CO2 increases global surface temperature? Anecdotal evidence makes for the best data cherry picking.